It was lunch time on a muggy late September day in 2013 when an explosion shook downtown Orlando, Florida. A warehouse on west Jefferson street was the casualty. Police cars, ambulances, and fire trucks were already on their way by the time Tim Roth, a good Samaritan, was on the scene. As he searched through the rubble and debris for injured humans, what he found was something else entirely. As described by the Orlando Sentinel in the next day’s paper, “among the knocked-down suits of armor, animatronics, old arcade games, clown suits and broken lighted signs (it was) as if (Roth) were in the Joker’s lair.” Fortunately, no humans were injured in the blast, but a wide collection of electronic amusements were destroyed beyond repair. For this warehouse belonged to Aaron Fechter, the inventor of the Whac-A-Mole. The situation is perhaps made even more comical given that Fechter’s other big success in the business world to date was the creation of the famous “Rock-afire Explosion” animatronics band, bits of which were now strewn about in the wreckage. After firefighters inspected the damage, investigators ruled that the blast was due to a ruptured pressurized fuel tank containing one of Fechter’s latest things he’s been working with- an experimental fuel called “carbohydrillium.” Carbohydrillium supposedly burns cleaner than propane and is particularly well-suited for cooking with. (Beyond that, there isn’t much information about it anywhere that I could find.) Fechter has been working trying to invent ways to use it in everyday life. So how did Mr. Fechter go from inventing the Whac-A-Mole, to an animatronic band, to playing around with experimental fuels? In the mid-1970s, Aaron Fechter was a young, ambitious inventor living in Florida. Before the age of 20, he had already conceived an idea for a small, fuel-efficient, three-wheeled car that he called the “Jutta.” When financing didn’t come through for the admittedly expensive idea, he moved to creating a contraption that sucked up leaves out of swimming pools – an almost reverse leaf blower. Thinking that this product was perfect for the homeowners of central Florida, he began selling it door to door. One of the people who opened the door knew a gullible, hungry kid when he saw one and “contracted” Fechter to create an electrical control system for amusement park shooting galleries. When Fechter gave him his control system prototype, the man decided he wasn’t going to pay Fechter, but took the device anyway. This wouldn’t be the last time this happened. After this, Fechter created his own company, Creative Engineering. With his new company, Fechter thought he could get his Jutta prototype off the ground. First, though, he needed to raise capital. So he entered into an industry that was quickly growing in Orlando- designing and building animated characters for the amusement park industry; or, as we call them today, animatronics. His first character went by the name “Scab.” It was a talking head with four movements. Fechter took him to the 1976 IAAPA (International Association of Amusement Parks and Attractions) Convention in Orlando in hopes of selling him, along with a talking rabbit named Willie Wabbit. Fechter would go on to sell both characters (Scab to DJ’s Oyster Bar in Tampa Bay and Willie to Mystery Fun House who placed him in a display case at the Orlando International Airport to advertise their attraction), but it was another interaction that Fechter had at that convention that led him to invent once again, or perhaps more aptly to borrow a concept and invent his own system for making it work. 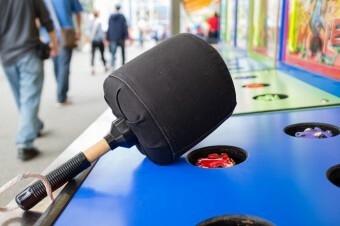 The game that resulted would come to be known as the Whac-A-Mole. As Fechter describes it, the credit should actually be given to others, such as a customer of his, a carnival operator who he thinks was named Denny Denton. Denny approached Fechter at the convention and pointed to “booth 13 with a bunch of Japanese guys.” They were playing a new game that involved animals popping out of holes. As they emerged, they would whack the animals with a hammer. Denny wanted a game like that, but the “Japanese guys’ game was always failing” and business communication was tough because “these guys didn’t even speak English, so (he) couldn’t even buy the game from them.” In other words, he wanted Fechter to build his own version of that game. Once completed, Fechter turned the game over to “this Denny Denton guy” who turned around and sold the prototype to Bob’s Space Racers in Daytona Beach (which is still in existence today – in fact, on the front page of their website it says “creators and developers of the Whac-A-Mole”). Once again, it seemed Fechter was hustled out of his invention. Bob Cassata (founder of Bob’s Space Racers) even called Fechter to Daytona Beach to get him to explain how the game worked. Fechter refused. Bob told him that didn’t matter because eventually he and his team would figure it out. Despite this, Fechter “harbored no resentment” towards Denny Denton or Bob Cassata because he thought of himself as a “rip-off guy” anyway, stealing from booth 13 at the 1976 IAAPA Convention. Plus, Aaron Fechter had “bigger fish to fry…” Turns out, he was right. Fechter kept working on what originally brought him to the IAAPA Convention- his animatronics. Creative Engineering Inc. continued to build unique, stylized, animatronic characters that gave their neighbor, Disney, a run for its money. They built a Dracula, a fortune teller named Lazlo, and a jovial guitar-playing bear sitting on a stump named Friendly Freddie, who was CEI’s first full-sized animated character. By 1978, CEI was designing, producing, and building fully animatronic shows. This included the “Santa Claus Revue” (sold to Santa’s Village in New Hampshire), “Confederate Critter Show” (sold to Magic World in Tennessee) and the “Wolf Pack 5,” a concept Fechter came up with after seeing a live London performance of the Rocky Horror Picture Show. The “Wolf Pack 5” played 1950s style rock and roll and consisted of Wolfman, Fats Gorilla, Dingo Star, Beach Bear, and Queenie. They would later be the basis (along with the country song singing “Hard Luck Bears”) for the show that would make Fechter both rich and famous. All of this caught the eye of one of the founders of Atari, Nolan Bushnell, and hotel chain owner Bob Brock. In 1977, Bushnell had created Chuck E. Cheese’s Pizza Time in San Jose, CA. The restaurant was essentially meant to be a family arcade/eatery. At the time, arcade games were frequently found in bars, which weren’t accessible to young kids. Bushnell would attend the IAAPA Conventions and he really admired Fechter’s artistic sense. CEI’s shows, while nothing technologically beyond what Bushnell could do, had a real sense of playfulness and the characters had a very distinctive style to them. Bushnell made several offers to buy CEI outright, but Fechter refused and seemingly didn’t care for Bushnell. Meanwhile, Bob Brock, who had put down significant financing into Bushnell’s Chuck E. Cheese’s, became concerned that the entertainment being provided by Bushnell wasn’t good enough. When Brock went to Orlando to check out Fechter and CEI, he now saw why Bushnell wanted desperately to buy CEI. But as Fechter had no interest in working with Bushnell, this left Brock in something of a pickle. He still thought the mini-amusement park-like restaurant idea was a great one, but felt Fechter’s work in the hands of any competing restaurant could put Chuck E. Cheese’s out of business. So rather than wait for that competitor to come along, he became it. Brock and Fechter went into business together. The first Showbiz Pizza Place in Kansas City opened its doors on March 3, 1980 with Fats Gorilla, Dingo Star, and the rest of the Wolf Pack 5 providing the entertainment. The Wolf Pack 5 was only used at the first Showbiz Pizza Place because that’s what CEI had in stock. They had every intention to create a unique show and all new characters for Showbiz. Thus, in July 1980, at Showbiz Pizza Place’s second location in Jacksonville, Florida, the Rock-afire Explosion debuted. Considered the “greatest animatronic rock band of all time,” the Rock-afire Explosion consisted of Fats Geronimo (basically, Fats Gorilla’s brother), drummer Dook LaRue, Mitzi Mozzarella, Billy Bob Brockali (the nephew of Friendly Freddie), Beach Bear, and Looney Bird. Meanwhile, with the launch of Showbiz Pizza Place, which was exactly like Chuck E. Cheese’s but with CEI’s animatronics, Bushnell sued Brock for breach of contract. After settlements and both companies co-existing for several years, Bushnell’s Chuck E. Cheese’s Pizza Time filed for bankruptcy and Showbiz bought them out. By 1992, both Showbiz Pizza and Chuck E. Cheese were struggling. Changes needed to be made. Brock wanted to buy Fechter’s twenty percent of the company and rights to all of the characters. Fechter said okay to the twenty percent, but refused to sell his characters. “These were my characters, and I thought I might do something with them in the future. So. I walked away,” Fechter would later say. Late in 1992, the Rock-afire Explosion was permanently replaced by Chuck E. Cheese characters. I put a lot of money in inventions that didn’t pan out. I don’t say I ‘wasted’ it. That’s like saying you wasted money going fishing. I ‘spent’ it. In the late 1970s, CEI also created an all-bear band called the “Bear Country Jubilee.” If you think the name seems quite similar to Disney World’s “Country Bear Jamboree,” you aren’t alone. When sold to Morey’s Pier in New Jersey, the company advertised their new attraction as coming “straight from Orlando.” While technically correct (after all, CEI was based in Orlando), the marketing was made to inspire confusion and hopefully bring in customers looking for a bit of Disney magic. Information about Creative Engineering Inc.